The following motivational and self-help guidebooks can save you lots of worry and stress. These handy little guides suggest positive solutions to some of the most typical problems that people face; friendships, relationships, and the pursuit of happiness. Author Charm Baker is a former educator and librarian, turned writer and author. Her interest and current focus is on personal growth and self-empowerment. Do you want practical tips that really work? Read what these guides have to say about solving everyday problems, including toxic friendships and relationship breakups. In 2018, the everyday problems that people face in life are not exclusive to seniors, middle-aged, or even young adults. Studies have shown that teenagers, adolescents, and even small children have their share of individual problems and stressors. This is apart from any major family or other issues that they may be having and have absolutely no control over. That is why the information in Several Simple Solutions is written in such plain and simplistic terms. This guide is a path to personal growth and self-empowerment. It can benefit ANYONE and help them make better decisions. When you live your life, always waiting to FIND happiness, it seems to become more and more unattainable. You no more have a chance of “finding” happiness, than you do of stumbling onto and discovering a rare gem or a huge sum of money (and you know what the chances of that happening are). Does that mean you’ll never be happy in life because the odds of “finding” happiness are too great? Of course not! In fact, you, me, and everyone in the world can be happy every single day, once you learn how to create your own happiness. Toxic friends can be some of the most fun and exciting people to be around, but that doesn't make them any less toxic! When it comes to the way we deal with people, many of the relationship gurus and experts have similar points to make. In this particular self-help book about friendships, you'll find lots of the same old advice but put in a thought provoking way. Recognizing toxic behavior is not always easy to do right away. Toxic friends appear as wolves in sheep's clothing at the start of a friendship. Negative traits may be obvious, but we sometimes, still miss the signs. · Do you know someone who is only your friend when you agree to do what they want? · Who decides which fast food joint or restaurant to eat at after shopping or an event? · Who always chooses the dvd or latest movie release you check out on a Friday evening? · Is the choice of club, bar or other Saturday night activity always left up to them? Relationship breakups can be really hard trying to get over and no one wants to deal with the pain, that is why many people stay in bad relationships. But the reality is, the sooner you face the fact that it’s over and go, the quicker you’ll start to get over it. Clearly, this is a whole lot easier said than done. 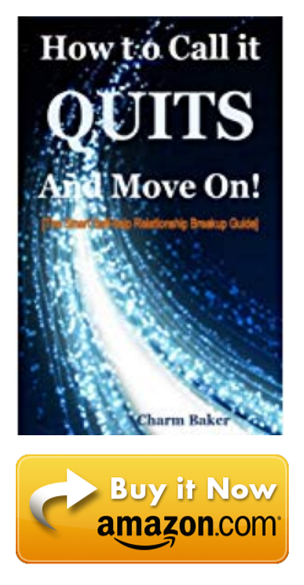 So the question is: How do you really get over a relationship breakup in a quick and painless way? Better yet, how will you ever be able to get along without the person who used to be the “someone special in your life? This simple little guide may be all it takes to get you on your way to healing and self-empowerment. As you read about three common reasons that a lot of women give for staying, think about which ones, if any, actually apply to you. Notice how these reasons for staying actually amount to excuses that we tell ourselves and others. These excuses allow us to fool ourselves into believing that perhaps things really aren’t all that bad. In reality, the reasons are nothing more than blinders on our eyes that keep us in denial.